OrthoBuzz occasionally receives posts from guest bloggers. In response to a recent New Yorker article by Atul Gawande, the following two commentaries come from Matthew Christian, MD, and Paul Matuszewski, MD, respectively. In his November 12, 2018 article in The New Yorker, Dr. Atul Gawande notes that more than 90% of American hospitals have been computerized in the past decade. In theory, that should make documentation easier, but Gawande cites a 2016 study revealing that most physicians now spend 2 hours documenting for every 1 hour of face-to-face patient interaction. That hit home to me when I joined a group practice that uses an electronic medical record (EMR) system for clinical documentation. One of my senior partners informed me that he spends 2 hours per day at home finishing clinic notes and dictations. The downside of digitization seems clear. Dr. Gawande cites a study noting that primary care physicians screen positive for depression at a rate double that of the general population. 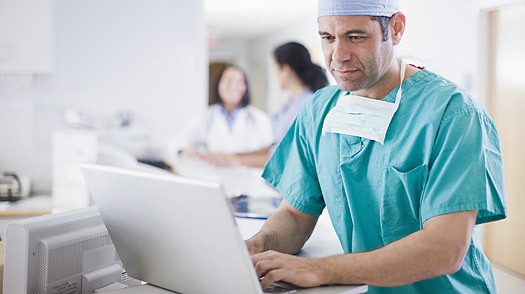 A Mayo clinic study discovered that the amount of computer documentation was a strong predictor of physician burnout. What makes medicine so engaging and satisfying for me is treating each patient in a unique and personalized manner. It seems that the last bastion of the happy physician is the proceduralist, of which the orthopaedic surgeon is an example. We spend 2 or 3 fewer days a week documenting clinical visits and instead solve unique and intellectually challenging musculoskeletal problems. This break from a computer screen frees us to do the thing we have spent our whole adult lives training for—practicing medicine. That is, until the procedure is complete and we must log in to complete the operative notes, postop orders, attending attestation, and other seemingly endless tasks. Matthew Christian, MD is an orthopaedic surgeon at OSS Health in York, Pennsylvania and a member of the JBJS Social Media Advisory Board. The electronic medical record—a marvelous marriage of modern technology and medicine to improve care for patients. At least, that was the promise. How it has played out over the past decade, however, leaves much to be desired from the perspective of physicians. Patient care has not been streamlined, and mounting evidence suggests that EMRs have increased the workload for physicians, adversely altered the physician-patient relationship, and increased the degree of physician burnout.1 Atul Gawande’s New Yorker article outlines his and other physician experiences with EMRs, concluding that many physicians—especially nonsurgeons bound to an office or clinic—now hate their computers. But why? Gawande describes the evolution of EMRs from simple “cool” programs into complex, “very uncool” systems, eventually culminating in what former IBM software engineer Frederick Brooks described as the “Tar Pit.” That’s when a system becomes so complex and universalized for so many different people and functions (clinical and administrative in the case of EMRs) that it becomes the electronic equivalent of miles of bureaucratic red tape. For physicians, the “Tar Pit” means more clicks, more steps, more checks, more alerts and notifications—with little or no improvement for patients and less work/life balance for doctors. Gawande relates the experience of a primary-care physician who once effectively maintained her own problem list for each of her patients. But the list has become in her words “utterly useless,” because now anyone across the organization can modify it, often inserting duplication and inaccuracies. Computerized complexity that adds more work but little to no value discourages physicians from engaging with the system, compounding the problem. Gawande’s article doesn’t go into detail about how we can solve this problem, but it presents several ways that physicians and hospital systems have coped. Some have resorted to medical scribes (often aspiring med students) or more highly trained overseas physicians who transcribe physician encounters. Some tech-savvy physicians expend effort to bend the software to their will – customizing components of the EMR despite pushback from vendors. This has led to various home-grown apps designed to help improve workflow and reduce hassles. Time will tell whether these or other workarounds will actually help. One thing is certain, however. Unless physicians take charge and guide the design (and redesign) of EMR technology, the system will fail to serve the physician, and the current reality of the physician serving the system will persist. Paul E. Matuszewski, MD is an assistant professor of orthopaedic traumatology and Director of Orthopaedic Trauma Research at the University of Kentucky School of Medicine and a member of the JBJS Social Media Advisory Board. Editor’s Note: The US Department of Health and Human Services has unveiled a draft plan to ease the burden of using EMR software. The draft strategy is open for public comments through January 28, 2019. Also, see this related OrthoBuzz Editor’s Choice post from JBJS Editor-in-Chief Dr. Marc Swiontkowski.